A very pretty red garnet and diamond daisy engagement ring hallmarked for Birmingham 1976. 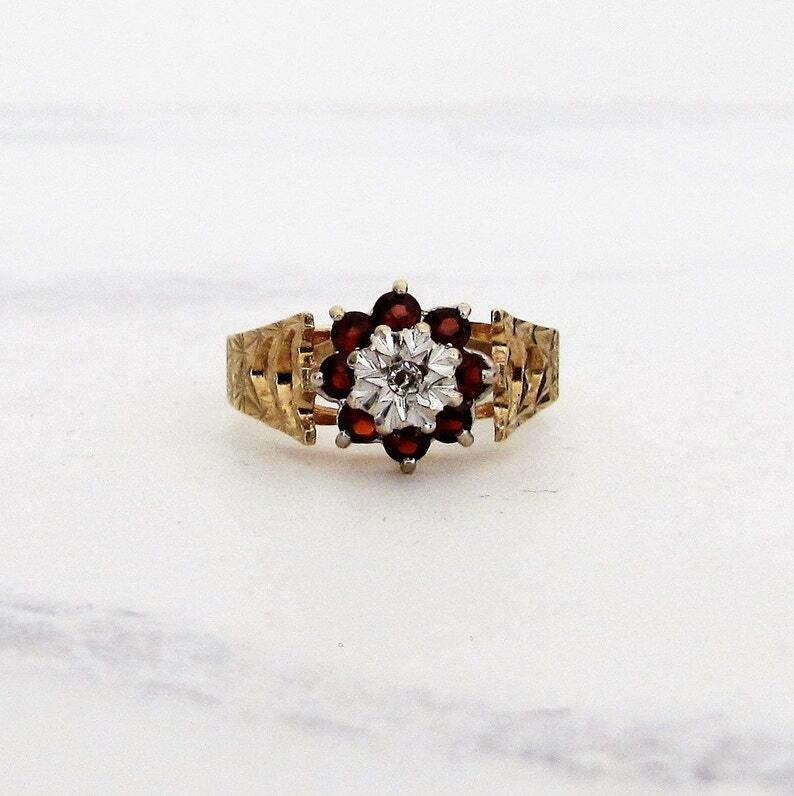 This floral motif ring features a cluster of red garnets surrounding a diamond that is illusion set in a white gold starburst. The illusion setting emphasizes the diamond making it appear larger and giving it a great deal of sparkle. Illusion set engagement rings were the height of fashion in the 1970s but this decorative technique has never really gone out of style. The stones are held aloft in a high basket tiered setting with the wide fanned shoulders featuring engraved star motifs and crescent shaped cut outs. The high basket setting allows for lots of light behind the garnets giving them a beautiful rosy glow. 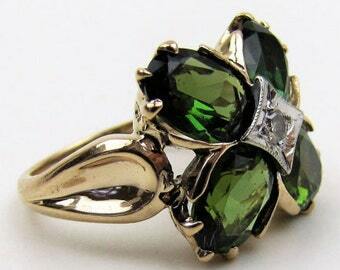 This is a substantial ring and just gorgeous! The garnet is thought to attract love and is the birthstone for January. GEMSTONES: Central diamond approx .07 ct, cluster of 8 red garnets measuring approx .03 cts each. MEASUREMENTS: Ring size 7-3/4 (US) P (UK) 56 (EU) with sizing available for an additional fee. The ring sits 7.5mm high with the face measuring 10x9mm. The shoulders measure 6.6mm wide sloping to a band width of 3.7mm at the back.